Producers Letty Aronson and Julian Schlossberg present the world premiere production of the brand new musical comedy Bullets Over Broadway, written by Woody Allen and based on the screenplay by Allen and Douglas McGrath for the 1994 film. 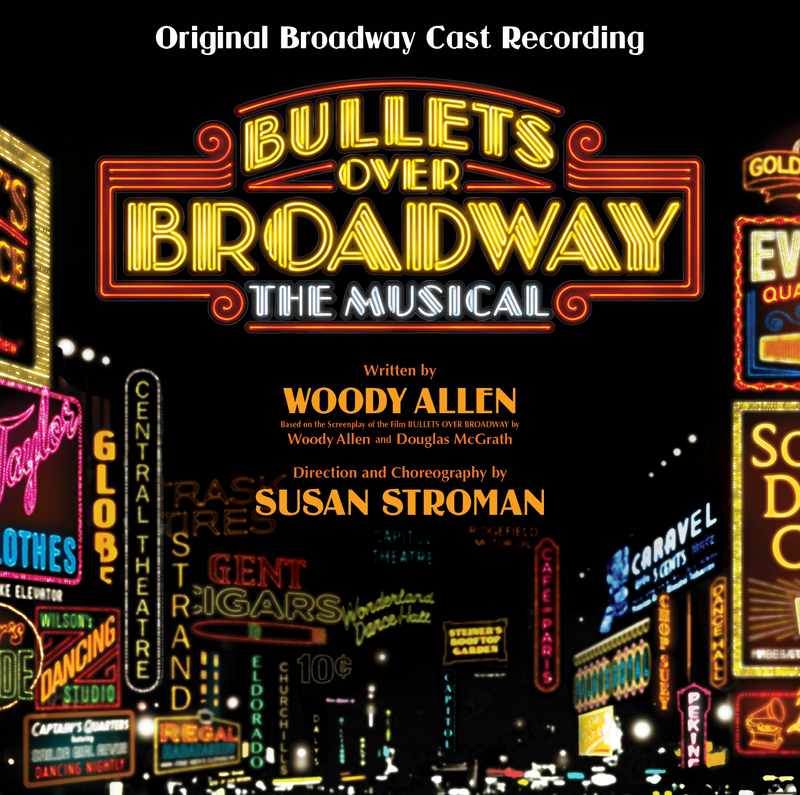 Directed and choreographed by five-time Tony Award® winner Susan Stroman, Bullets Over Broadway premiered April 10, 2014 at The St. James Theatre. Bullets Over Broadway tells the story of an aspiring young playwright (Braff) newly arrived on Broadway in 1920’s New York who is forced to cast a mobster’s (Pastore) talentless girlfriend (Yorke) in his latest drama in order to get it produced. Bullets Over Broadway features Brooks Ashmanskas (The Producers) as “Warner Purcell,” Golden Globe® and Emmy Award nominee Zach Braff (“Scrubs,” Garden State) as “David Shayne,” Nick Cordero (Rock of Ages) as “Cheech,” Tony Award® nominee Marin Mazzie (Passion; Ragtime; Kiss Me, Kate) as “Helen Sinclair,” Vincent Pastore (“The Sopranos”) as “Nick Valenti,” Betsy Wolfe (The Mystery of Edwin Drood) as “Ellen,” Lenny Wolpe (The Drowsy Chaperone) as “Julian Marx,” Heléne Yorke (Grease) as “Olive Neal” and Tony Award® winner Karen Ziemba (Contact) as “Eden Brent.” Bullets Over Broadway also features Clyde Alves (Nice Work if You Can Get It), Jim Borstelmann (Chaplin), Preston Truman Boyd (Big Fish), Janet Dickinson (How The Grinch Stole Christmas), Bryn Dowling (Big Fish), Kim Fauré (Anything Goes), Paige Faure (Cinderella), Casey Garvin (Bare), Kelcy Griffin (Broadway debut), Dan Horn (Cinderella), Sarah Lin Johnson (Broadway debut), Andy Jones (Cinderella), Amanda Kloots-Larsen (Follies), Kevin Ligon (The Chosen), Synthia Link (Big Fish), Brittany Marcin (Anything Goes), Paul McGill (La Cage aux Folles), James Moye (Million Dollar Quartet), Beth Johnson Nicely (Irving Berlin’s White Christmas), Eric Santagata (Chaplin) and Kevin Worley (Cinderella). Five time Tony Award® winning director and choreographer Susan Stroman brings the new musical to the stage with a design team of Broadway veterans including Santo Loquasto (scenic design), William Ivey Long (costume design), Donald Holder (lighting design), Peter Hylenski (sound design), Paul Huntley (wig and hair design), William Berloni (animal training), Glen Kelly (music supervision and adaptation / additional Lyrics), Doug Besterman (orchestrations) and Andy Einhorn (music direction/conductor and vocal arrangements). The Broadway production of Bullets Over Broadway features existing music of the period. Bullets Over Broadway is produced by Letty Aronson and Julian Schlossberg and co-produced by Edward Walson, Leroy Schecter, Roy Furman, Broadway Across America, Just for Laughs Theatricals/Jacki Barlia Florin, Harold Newman and Jujamcyn Theaters and associate producer Don’t Speak, LLC.